If you think about it, singing is a complex activity. It involves the brain (verbal memory, pitch, sense of rhythm). You need your respiratory muscles to generate sound and volume. And, unless your singing is strictly a private affair, it requires a decent amount of confidence. Julianna has always considered singing to be one of her talents. J and Steve are watching Cinderella. The step sisters are singing. J: They are not good singers. S: What about Cinderella? Is she a good singer? J: She is a good singer, but not as good as me. It has gotten more difficult. 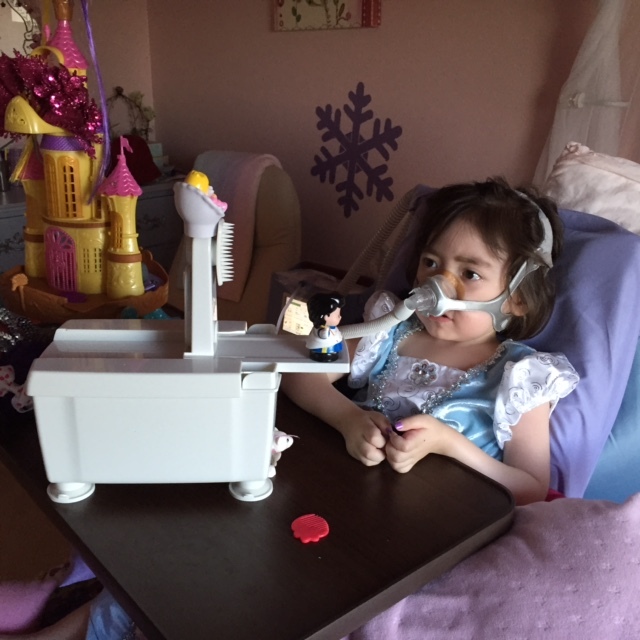 She needs BiPAP to breathe, and her right diaphragm is paralyzed. Her vocal cords do not open fully. She does, however, have a perfectly good brain and plenty of moxie. (Note the dramatic arm movements. In this moment, she is Elsa. J: Because you are brown and not sparkly! Miss J is the MOST sparkly!